We have designed and build a number of custom cars that have been featured in worldwide publications, won numerous trophies and unlike many other show cars were built to be daily drivers with durability in mind. Here are some events we have been featured in. MADNESS Autoworks featured on Drive! The mutant machines of the LA Auto Show! "..If you ever get a chance to visit the LA Auto Show - either over the next week or in the future - don't be scared to trek down into the dungeon and visit the mutants." 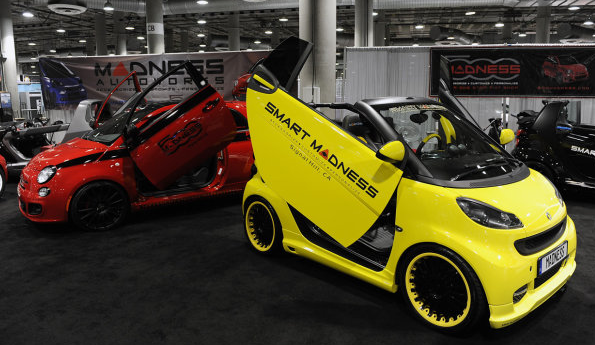 MADNESS Autoworks featured on LA Auto Show! Here at MADNESS Autoworks, we love creating unique projects with unique cars. 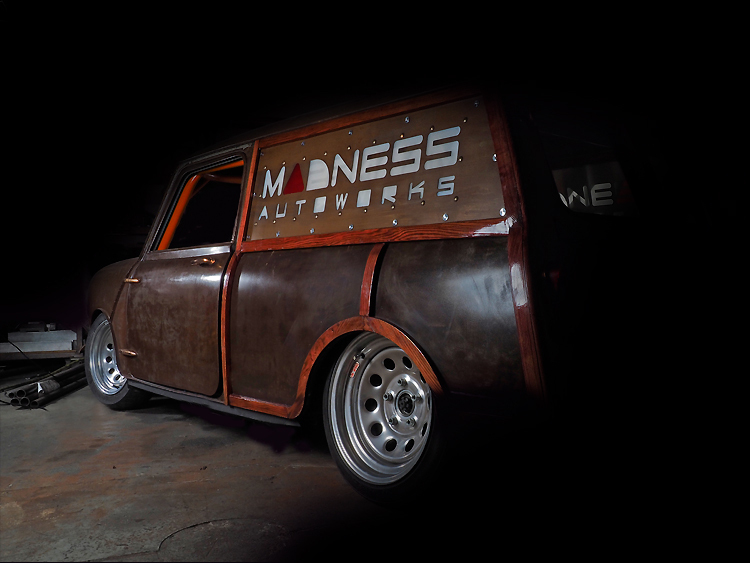 We built a performance based Morris Mini Woody Wagon here at our shop, designed to be a car to take out on Auto X and other light tracks days to have lots of fun in! We are unavailing our hard work and dedication at the 2014 Los Angeles International Auto Show. Velocity premiered a One Hour Special called "High Performance Road Trip". This TV Special highlighted a very special build. The show was a joint production of two popular TV Shows (All Girls Garage and Car Fix). The show showcased a stock ABARTH being transformed to a custom, one of a kind performance machine courtesy of the ladies of All Girls Garage, the men of Car Fix and the assistance of the MADNESS Autoworks Crew. MADNESS Autoworks is an independent site and company that is not affiliated with MINI USA, BMW Group, MINI, Cooper, John Cooper. Copyright © 2016, LLC. All rights reserved. All other company and/or product names, descriptions, or written content may be trade names, trademarks, and/or registered trademarks of the respective owners with for which they are associated.